This set of Python Programming Questions & Answers focuses on “Lists”. 1. Suppose list1 is [3, 4, 5, 20, 5, 25, 1, 3], what is list1 after list1.reverse() ? a) [3, 4, 5, 20, 5, 25, 1, 3]. b) [1, 3, 3, 4, 5, 5, 20, 25]. c) [25, 20, 5, 5, 4, 3, 3, 1]. d) [3, 1, 25, 5, 20, 5, 4, 3]. Explanation: Execute in the shell to verify. 2. Suppose listExample is [3, 4, 5, 20, 5, 25, 1, 3], what is list1 after listExample.extend([34, 5]) ? a) [3, 4, 5, 20, 5, 25, 1, 3, 34, 5]. b) [1, 3, 3, 4, 5, 5, 20, 25, 34, 5]. c) [25, 20, 5, 5, 4, 3, 3, 1, 34, 5]. d) [1, 3, 4, 5, 20, 5, 25, 3, 34, 5]. 3. Suppose listExample is [3, 4, 5, 20, 5, 25, 1, 3], what is list1 after listExample.pop(1) ? c) [3, 5, 20, 5, 25, 1, 3]. d) [1, 3, 4, 5, 20, 5, 25]. Explanation: pop() removes the element at the position specified in the parameter. 4. Suppose listExample is [3, 4, 5, 20, 5, 25, 1, 3], what is list1 after listExample.pop()? a) [3, 4, 5, 20, 5, 25, 1]. Explanation: pop() by default will remove the last element. 5. What is the output when the following code is executed ? Explanation: split() function returns the elements in a list. 6. What is the output when following code is executed ? b) [‘a b c d’]. 7. What is the output when following code is executed ? Explanation: First time the highest number is encountered is at index 1. 8. What is the output when following code is executed ? 9. What is the output when following code is executed ? Explanation: Lists should be copied by executing [:] operation. 10. What is the output when following code is executed ? b) [1, 2, 3, 44]. 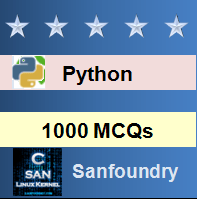 To practice all programming questions on Python, here is complete set of 1000+ Multiple Choice Questions and Answers.